Does DJI's Tiny Mavic Pro Crush GoPro's Drone Dreams? DJI’s new foldable drone, the Mavic Pro, looks incredible. The announcement comes about one week after the GoPro Karma, another foldable drone, was announced. So how do the two flexy drones stack up against each other? It depends who is flying and under what conditions. 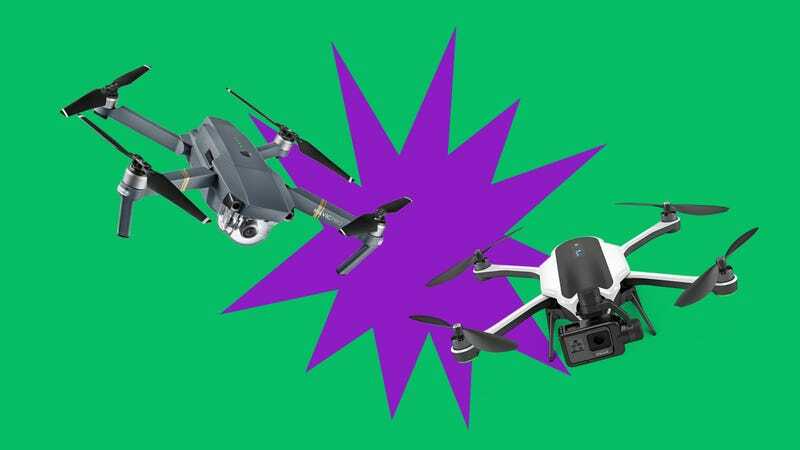 On basic specs, the DJI Mavic Pro seems to have bested the GoPro Karma in several categories. It has a faster top speed (40 mph versus 35 mph), it has a longer battery life (27 minutes versus 20 minutes), and it can even be outfitted with any phone or tablet you want. The Mavic Pro is also small enough to fit uncomfortably into a pair of jean pockets. The Karma, on the other hand, requires a backpack (or similarly-sized vessel) to be transported from place to place. The first difference you’ll notice between both drones is the controllers. The GoPro Karma ships with a controller using a built-in display and packs up nicely into the little backpack that comes with the Karma. The Mavic Pro has an optional controller, meaning you can instead operate the device from your phone. The controller that DJI sells separately can be paired with any phone if you want to see preview preview video while you’re flying. Going deeper, the Mavic Pro comes with five-camera obstacle avoidance system similar to the one in the Phantom 4. The GoPro Karma doesn’t have any obstacle avoidance features, though, as one of our testers found out the hard way, DJI’s sensors don’t work in every scenario. DJI’s camera system also enables some cool features such as gesture control. For example, moving your hands in the shape of a square prompts the drone to take a picture from the drone’s camera. It’s a neat trick (especially during a live demo), but my guess is that the gesture controls won’t be nearly as practical in real life. The Mavic Pro also comes with some cool follow modes. The drone can lead you in front, follow you at a profile and do a cool trick where it files circles around you as you move. The smart flying capabilities are enabled by the cameras and sensors on the drone. It’s still unclear whether the GoPro Karma will offer a follow me function, but we’re really hope so given the adventure-loving customer base. One aspect that could be the difference maker for these competing foldable drone systems is their camera systems. The DJI Mavic Pro ships with a camera that shoots 4K video, but it’s bolted to the drone, so you can’t exactly use it while you’re not flying the drone around. The GoPro Karma was built to combat these type of situations. It can be outfitted with the new GoPro Hero 5 Black, the Hero 5 Session, Hero 4, and Hero 3 cameras. If you already own one of theses cameras, the Karma is a great way to get them airborne, but if you still need to buy one, it could just make the cost of your aerial rig a lot more expensive. Another neat feature of the GoPro Karma is its removable stabilizer that can be used as a handheld gimbal for shooting nice clean shots on or off the drone. When it comes to versatility of video recording, the GoPro Karma easily beats DJI. As for price, the DJI Mavic Pro sells for $750 without the remote control (which means you’d have to use your phone or tablet to control it) or $1,000 with the controller. The GoPro Karma sells for a flat price of $800 and comes with a controller that uses a built-in display. The total cost depends on what camera you strap to it. It costs $1000 with a GoPro Hero 5 Session, and $1100 with a GoPro Hero 5 Black. When it comes to drones and budgets, there’s not a one-size-fits-all situation, so the perfect foldable drone will be a matter of preference. Without spending too much time flying either drone, though, it looks like the DJI has a slight edge in terms of performance and value. Obviously, we’ll need to take both of these drones out for a true head-to-head test flight in order to determine which is the best. We’re hoping to get our hands on both drones in the coming weeks so we can really test the claims both companies are making. Ahead of that head-to-head battle, it looks like DJI has the slight edge, at least on paper.